Pastor Enoch Adeboye in Benue. “We want these killings to stop. Happily, we know someone who can stop it." At a time authorities in Nigeria are looking for a final solution to the incessant killings in Benue State and other parts of the middle belt, there seems to be a way out. General Overseer of The Redeemed Christian Church of God, Pastor Enoch Adeboye has finally revealed who can stop the bloodbath. 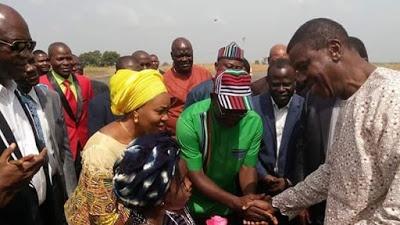 Adeboye, alongside his wife Folu were in Benue on Friday to condole with Governor Samuel Ortom and the people of the state. He expressed displeasure over the killing, saying he is also deeply pained by the loss of lives. “Of course, no man of God will see a mass burial anywhere and not feel the pains of the people affected. “We want these killings to stop. Happily, we know someone who can stop it. “He is the almighty God, He does not fail or compromise, He is the God of all. Ortom, in his words, lamented that the incursions of herdsmen into the state, apart from leading to the deaths of many, had created a huge humanitarian crisis in the state.